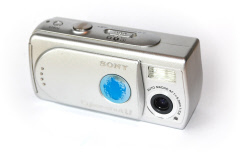 This was my first camera, and the one that got me started in photography. 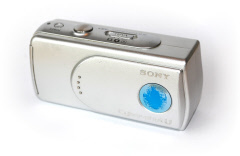 The DSC-U30, so named because of You, Your Friends and "U" [*][a], wasn't a professional's camera by a long shot. But it was a lot of fun. It didn't have any manual controls, nor did it have zoom. The light-blue circle is (or rather, was) a mirror that you could use to take a self portrait, or a photo of yourself and someone else. I could never get the aiming figured out despite this, though. This starts the camera. It goes from off to ready for shooting in one second. The USB socket is under the rubber seal in the bottom right, and to the right we see the cover of the battery and memory stick compartment. The screen showed preciously little in terms of post-shot review. 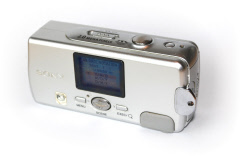 One could press the right button to zoom in 5x on the photo, but since the little display only had 64460 pixels, that only gave you an 80% view of the image. A beginner like me wasn't confused by all the parameters that a DSLR exposes - aperture, ISO, white balance, and all that - which put focus on getting the composition right. I've realized that once the composition is good, you'd have to try real hard to fail; and if the composition is bad, well, then there's nothing you can do. It is so tiny I could put it in my pocket and have it with me all the time. As I write this, I have one camera with me - the one that is in my cell phone. My D40? It's at home. I cannot overstate the importance of daily practice. Having a camera with you, always, means that you will get better. It was also tons of fun: See something pretty? Capture it! It starts instantly. Just flick back the lens cover and the camera is ready to shoot in a second. My cellphone requires me to press one button to bring up the lock screen, unlock the phone, tap one icon and wait two seconds for the camera to start. Talk about the state of the art of technology moving backwards! A small bridge at Åkers Styckebruk. Photo taken in November 2003. Autumn leaves in Husby, after the rain. Photo taken in October 2004.